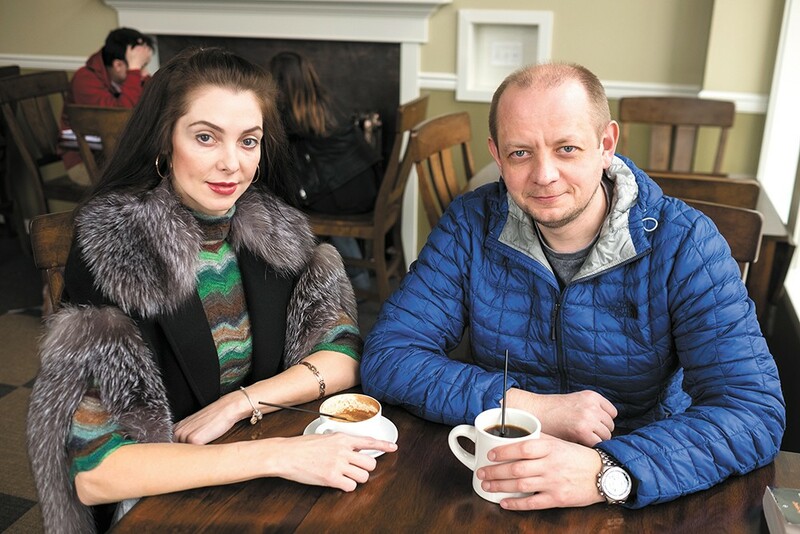 Iryna and Igor Anisimov opened Cedar Coffee in November. Fleeing a brutal war in their home country Ukraine, Igor Anisimov and his family arrived to the U.S. in September of 2015. Soon after, Anisimov discovered a local coffee shop on the corner of North Monroe Street. He began stopping by every day, so when that shop, Coeur Coffeehouse, closed its doors rather unexpectedly last spring, he was deeply saddened to see the end of a familiar place in his new city. "Like always, I came here and the door was closed," Anisimov recalls. "It was terrible for me and my wife. And then, I don't know how, but I just thought maybe we could continue the business." He tried to track down the shuttered shop's owner, but was unsuccessful. Determined to revive the corner coffee shop in some way, and become a business owner himself, Anisimov eagerly pursued these dreams. All of his hard work came to fruition when Cedar Coffee opened its doors in November. "I am a businessman in my mind and my heart," Anisimov says with a smile, seated at a wooden table inside the brightly sun-lit business. "I love business, and I love coffee. The coffee shop is not just business, it's my life, my love," he continues. As a refugee with no financial history in the U.S., Anisimov had trouble getting a bank loan to start his dream business. Eventually, he connected with Spokane Neighborhood Action Partner's (SNAP) Financial Access and Business Development services, which guided him through processes of permitting, licensing and other requirements to open Cedar Coffee. Roast House Coffee owner Deborah DiBernardo was also instrumental in helping Anisimov get Cedar Coffee ready for business, connecting him with employees who'd previously worked for her (a few also still do), and becoming Cedar Coffee's exclusive local roaster. DiBernardo's connections led Anisimov to hire Cedar's manager, Kira Elmer, and one of its baristas, Kyle Siegal, who was also a former employee of its predecessor, Coeur. Cedar's drink menu offers the traditional coffee house espresso lineup: lattes, mochas, cappuccinos, macchiatos and more, along with more than 13 varieties of tea, and locally made chai tea from Mandala Chai Company. Pastries served there are made locally by Common Crumb Artisan Bakery. Drink syrups are made in house, including Anisimov's favorite, a maple bourbon syrup that he personally crafted. Anisimov plans to continue adding other drinks to the menu, like ginger tea. He would also like to add a traditional Russian beverage called kvass, a fermented drink similar to kombucha, but slightly sweeter. It's very popular in Ukraine, but Anisimov doesn't think American customers would have the same taste for it. Cedar Coffee's name and logo, featuring a squirrel and a cedar cone, are nods to Anisimov's homeland Ukraine. "Cedar means strong, and long life," he explains, adding that he owned an unrelated company by the name Cedar back home, along with a couple of coffee shops. Anisimov closed one of the shops after Russia's invasion of Ukraine back in 2014; he still owns the other. He hopes to open additional businesses, perhaps coffee shops, in Spokane as he becomes more familiar with American business practices, and more comfortable speaking English. The original print version of this article was headlined "Coffee Culture"